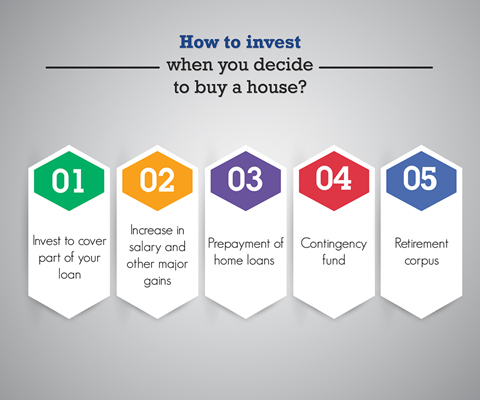 How to manage your investments and a home loan? Buying a house is really an expensive affair, it could be hard for most to continue with their other investments. However, it is smarter to cut down costs and invest some money even during these times. Owning a home is one of the most important aspects of a person’s life. There is emotional, personal and cultural significance attached to this event. Obviously, it is a significant investment holding severe financial significance. Most working individuals start planning early for this investment. An important part of the savings is diverted towards the down payment of the loan. Further, a good part of their income goes towards the payment of the equated monthly installments or EMIs. However, as buying a house is really an expensive affair, it could be hard for most to continue with their other investments. However, it is smarter to cut down costs and invest some money even during these times. This would only help you in the long run. Let’s take a look at a few of the advantages. Its good to divert a part of your funds into a long-term investment plan. An amount of Rs3,000 per month can be invested in an equity vertical. This can yield a sizeable amount to pay off a significant chunk of your home loan. You can divert these funds into a lower-risk based debt fund and be safely invested. If you have been saving for some time, you can use part of this fund to prepay the principal amount of your home loan. This can reduce some of your burden. Though buying a home is an important event in one’s life, it is important to do a thorough analysis of the finances before even thinking about it. It would be unwise to compensate for your investments while deciding to buy the home. One must jot down the figures and calculate all current and future expense to arrive at the component which can be used towards buying a house. The following two are the most important prerequisites. One must always work out the monthly expenses he/she incurs. A fund which can sustain you for six months must be kept aside. This is called the contingency fund and should be saved for emergencies. One can invest this fund in a debt fund instead of just allowing it to lie in a savings account. The retirement corpus is a long-term investment. It cannot be compromised. After all, we all have to retire, and it is common sense to be financially independent at that time. One should not compensate for the retirement corpus while buying a home. With proper planning and early investment, one can have a healthy retirement corpus after their professional life.